Energy efficiency and environmental sustainability are common phrases we hear every day. As the public embarks on the pursuit of sustainability, demands for environmentally responsible home improvement projects have also inspired the development of energy efficient roofing, windows, and other eco-friendly alternatives. When it comes to smart roofing choices, metal roofing is doubtlessly the energy efficient roofing solution for a greener future. As your local expert in metal roofing, Global Home Improvement is more than happy to provide your home with the energy efficient roofing you need to do your part for the environment. These roofs look as good as they perform, and you can rest assured knowing that you've installed a high-quality roof on your home. Interested in energy efficient metal roofing? Contact Global Home Improvement online today to schedule a free estimate! We serve customers in PA, NJ & DE and areas nearby. 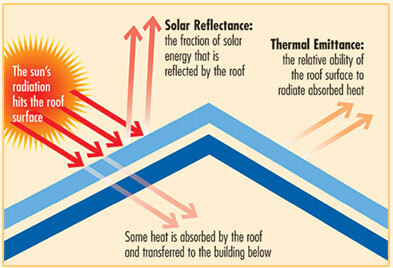 Energy efficient roofing describes any roof that reflects more sunlight than it absorbs. Because energy efficient roofs often trap less heat than a standard roof, they are commonly called “cool roofs.” According to the U.S. Department of Energy, a cool roof can be made of “a highly reflective type of paint, a sheet covering, or highly reflective tiles or shingles.” On a hot day, a cool roof can lower the temperature of your roof by up to 100 degree Fahrenheit, while reducing peak cooling demands by 10 to 15 percent. Generally speaking, pursuing energy efficiency in every aspect of your life is extremely important for the well-being of the human race and the environment as a whole. Aside from the reduction of energy spending by using efficient roofing, it will also drastically slash back fossil fuel consumption and carbon emission. For many homeowners who are abandoning asphalt shingles, seeking energy efficiency roofing is simply an easy and affordable step toward sustainability. With an average family spending at least 15% on their cooling bills (sometimes even up to 70% in warmer climates), it is time for homeowners to retain some of their hard-earned income by investing in energy efficient metal roofing. As an Energy Star certified roofing solution, the superior reflectivity and emissivity found in a metal roof will effectively reflect incoming solar radiation and decrease the amount of heat transferred into your home and attic. When compared with an Energy Star certified asphalt roof, a typical metal roof has a solar reflectance value of at least 61%, while the value of an asphalt roof has never exceeded 40%. A metal roof can also save homeowners up to 40% in their cooling costs. Additionally, metal roofs are known to live above and beyond 60 years. Unlike asphalt shingles that contribute around 11 million tons of landfill waste on an annual basis, the 100% recyclable, non-toxic content of metal roofs make it extremely difficult for any metal roof materials to make it to landfill. From service to retirement, metal roofs are the green, energy efficient roofing solution for every homeowner. By putting quality, energy efficiency, and beauty together, Global Home Improvement will provide the best metal roofing service unmatched in the industry. With a variety of design options to choose from, you will definitely find a customization option that fits perfectly with your personal taste and architectural design. Our high-quality metal roofing materials are installed by our roofing professionals to ensure that your new metal roof is ready to withstand extreme weather conditions, windblown debris, pests, and even fire. Pursuing an energy efficient life by installing an energy efficient metal roof is a smart investment with long-term returns. Live more energy efficiently today by scheduling a free estimate with Global Home Improvement!